Rapidly Detecting and Addressing Security Threats to Mitigate Risk at SBV | Qualys, Inc.
BUSINESS: SBV Services is South Africa’s leading cash risk management company, specialising in moving and processing cash, cheques and valuables safely and securely. BUSINESS CHALLENGE: SBV Services must protect highly sensitive financial data, as well as logistical information about the movement of enormous amounts of cash and other valuables. Rapid time-to-value meant that IT staff could focus on getting results. Comprehensive and flexible automated reporting capabilities ensure that IT staff and management quickly understand emerging risks. Easy access to learning materials online ensured rapid adoption and short time-to-value. To protect its business systems from increasing internal and external security threats, SBV Services implemented a cloud-based risk-management platform to identify and track potential vulnerabilities. 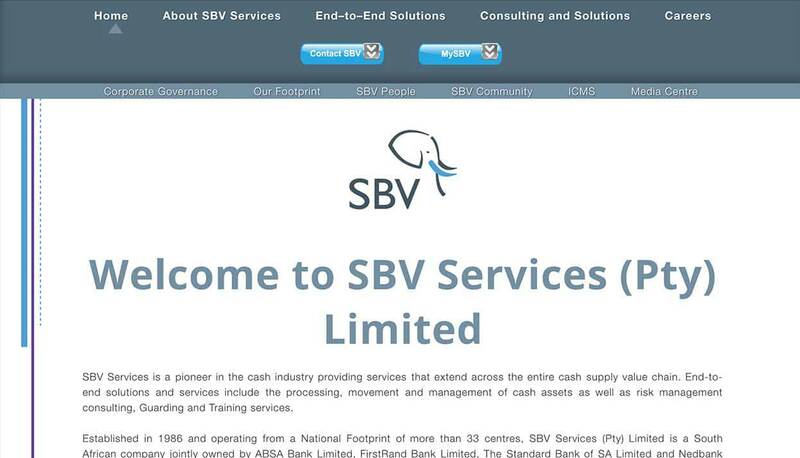 SBV Services specialises in wholesale and retail cash processing and transiting, offering services such as bulk asset movement, asset management consulting and guarding resources. With 33 centres across South Africa, SBV Services provides end-to-end solutions for a wide range of clients and industries, including banking, retail and entertainment companies as well as government institutions. SBV Services is responsible for moving the majority of all cash in South Africa, and keeping its business systems secure is of fundamental importance. The company places great emphasis on closing any potential security gaps in the numerous systems, such as cash processing, logistics and financial settlement applications that store its own or its clients’ sensitive financial data. With a number of business critical applications involved in its cash processing operation alone, this is no small task. A further potential source of network risk is that more and more employees are choosing to bring their personal mobile devices onto the company network. “With anywhere from 500 to 1,000 personal devices, such as tablets and smartphones, active on the network at any one time, and with all staff able to access mail and other data via VPN clients, the potential attack surface has grown quickly,” states Kevin Govender. Recognising that the growing scale of its IT infrastructure made manual approaches increasingly unworkable, the SBV Services IT team reviewed its tools providing automated vulnerability assessments and reporting. After considering solutions from a number of vendors, SBV Services decided to follow recommendations from leading global IT analyst firms advocating the Qualys Cloud Platform—an integrated suite of powerful IT security and compliance solutions. “Through the Qualys website and online community, we could gain a deeper understanding of its features. Based on what we found, we determined that Qualys Cloud Platform was the solution best suited to our requirements, and decided to implement it,” explains Kevin Govender. After starting with a controlled Proof of Concept, SBV Solutions implemented Qualys Cloud Platform, gaining a dynamic central repository of information on cross-platform vulnerabilities and how to mitigate them. The small IT team at SBV Services lacked the time required for deploying an on-premise vulnerability management solution. Qualys’ Vulnerability Management solution, which sits on top of the cloud platform, scans all systems on the SBV network, automatically detecting and flagging any known vulnerabilities, and generating detailed reports that let IT staff know which patches they need to install. The solution provides multiple levels of reporting, from these patch reports up to top-level reports on the overall risk, such as the total number of Level 5 or 4 vulnerabilities. This built-in reporting capability was one of the key features that attracted SBV Services to the Qualys solution. The effectiveness of the Qualys Cloud Platform was proven in a highly visible way when the Heartbleed security bug hit the headlines. Automatic vulnerability assessments and reports from the Qualys Cloud Platform give SBV Services staff a clear view of potential security issues across the entire network, including personal devices, saving significant time and effort. Reports are issued throughout the company, from risk executives down to the teams running each application or service, enabling efficient, effective and transparent response to identified threats. Kevin Govender adds: “The Qualys solution features have remarkably sophisticated reporting capabilities, giving us the information we need at the speed we need it.